Discover a more collaborative way to manage projects. To ensure collaboration and project success, it is crucial for all project stakeholders to understand their roles and responsibilities and those of other project members. This is especially important when project teams are more complex due to their large size, involvement of distributed team members, or reliance on staff from multiple departments. This guide will explain when to use RACI, why it works, guidelines to use it effectively, and the role it can play in effective project management. Lastly, we'll show you that once you've created your own matrix, you'll need a collaborative, real-time tool, like Smartsheet, to manage the rest of the project details — from start to finish. RACI has four participant types that are explained below. It’s imperative to understand each of these before creating a RACI matrix. A role that is “Responsible” for completing the task or deliverable. If the responsibility role, for example, is technical writer, the technical writer may be responsible for writing online help files. A software developer wouldn’t write the help files, but might incorporate those files into the product, which would be a different task. A role that is “Accountable” has the final authority or accountability for the task’s completion. As with the previous example of a technical writer developing online help and a software developer incorporating the help files, a product manager might be responsible for seeing that the files are in the product. A role that is “Consulted” is an adviser to a task. For example, a Scrum Master might be consulted because they are a subject matter expert. Advisers should be considered carefully as too many people in this role can stretch the task time and raise the risk of poor performance. A role that is “Informed” is kept up to date on task completion. Charting this role helps to illustrate dependencies and also ensures that transparency into task status exists. Identifying those who require status updates can be complex, so it is worthwhile to take the time to consult various roles to determine if they need to know when a task is completed. For example, the sales manager may require status updates because a customer has a special interest in the development of a feature. A RACI Matrix is useful as a general practice of project management, but there are some definite indicators for implementing the RACI paradigm. If the approval process is bogged down, it may be due to role confusion. If decisions are being overruled often and seemingly arbitrarily, this is also a situation that can benefit from clarifying roles. Another situation that frequently occurs is that many people perform the same analysis tasks. When tasks are not getting done, it may be that nobody knows who should be doing them. When the authority to perform tasks is not understood, it may be time to define roles and tasks, responsibilities, and authority. Eliminating this sort of confusion and clarifying roles and tasks is the chief function of a RACI Matrix. PACSI – Used in situations where multiple stakeholders can review and veto the work of a single accountable person. The roles include Performed, Accountable, Control, Suggested, and Informed. RAPID – Created by Bain & Company to clarify decision accountability through clear role and responsibility delineation. The roles include Recommend, Agree, Perform, Input, and Decide. Implementing a RACI model allows you to involve more qualified minds in your projects. And, it’s an easy chart to develop. Project managers will appreciate that they can use this method to develop a chart quickly that provides Project-Allocation-At-A-Glance. Preventing over-allocation of resources to one project and under-allocation to another. Clearly defining roles to all the people who fill them (clear understanding of expectations is key to a smooth project and reduces the need for conflict resolution later). Ensuring no task is overlooked when resources are allocated. Providing a fast and efficient way to re-allocate resources when there is turnover. New people can quickly identify their roles in a project and the roles of those with whom they must interact. Finally, because the Informed category is given equal weight, the RACI Matrix encourages communication between roles. Communication is the key to clearly understanding expectations, which results in a smooth project. A RACI chart is a matrix of all project activities associated with the responsible people or roles. “All project activities” includes everything from the day you begin, such as planning, test, design, support, etc. Decide how to chart the matrix— You can use any number of tools or templates, including a spreadsheet, whiteboard, or software solution. Identify the project tasks (or deliverables)—Meet with key stakeholders to develop a list of project tasks. For this discussion, “tasks” include activities such as meetings or events that must take place, as well as deliverables such as features or products. Tasks are labeled across the X or Y axis of the matrix. For example, if you are charting a software project developed under Agile, the Sprint Demo Meeting may be a required activity and should be included in the matrix as a task. Don’t forget to add maintenance of the RACI Matrix as a task. The project manager usually maintains the RACI Matrix. Identify the project roles—Project roles are labeled down the axis of the matrix that was not used for tasks. The project roles make the matrix more understandable and can be useful for adding data you may have forgotten. As you identify roles, you’ll remember tasks for those roles, so add them to the task axis. Also, the task axis is useful for identifying roles and clarifying resource allocation. This is a good time to assign names to roles as well - one name per role is optimal. Label the intersections of the axes—Where the X and Y axes intersect, label the intersection with an R, A, C, or I to finalize the matrix with who is Responsible, Accountable, Consulted, or Informed on each task. RACI templates will save you time and provide a starting point for building your chart. However, there are numerous templates available and you should review the varying styles to find one that fits your project needs. Some templates use the X axis for the tasks and Y for roles, and others do the opposite. If tasks exceed roles, as they generally do, it is easier to use the X axis for tasks and the Y for roles as you will be able to see the greatest number of roles per task at a glance on most computer monitors. On the other hand, you may find it easier to filter a chart based on role (for instance, filtering to show only the “I” roles for a given task) with the tasks on the X axis. In addition, most templates use some form of color-coding. Regardless of which template you select, using one will eliminate a lot of basic work in constructing the chart and will free your time to define roles and tasks. RACI project management is focused on analyzing and managing the RACI Matrix to identify problems, resolve conflicts in roles, revise role categorization, and provide the team an opportunity for feedback. Analysis should be done in a team meeting, though the meeting may not require every single role holder to attend. If one role has too many responsibilities, should some responsibilities be reallocated or should more people be assigned to the role? If only one person is Accountable, is it reasonable to expect that person to make all decisions and could it threaten the project by creating a bottleneck? If there is a task with no one Responsible, should someone be assigned or should the task be eliminated? If there is a task where no one is Accountable, who has decision-making authority? If there are multiple people Accountable for a task, avoid conflicts by making a single person accountable. If too many people must be consulted, evaluate whether one person can be assigned who talks with others involved. Concern over who makes decisions—Decision-makers are usually labeled as Accountable, but it may be that decisions are being made by the Responsible party. If that’s the case, the team should know who makes decisions in each situation. Finger pointing—If work is not completed on time, finger pointing may result. The key to avoiding this is knowing who is Responsible. Poor resource allocation—The RACI Matrix should make resource allocation very clear, but sometimes a single task can be extremely taxing, leading to some issues concerning who should be doing what and when. Lack of action because of ineffective communications—If someone is not Informed, they may not know to perform a task. Too many consultations because the wrong people are consulted—The Consulted should be clearly labeled to avoid jeopardizing the project schedule. It is the duty of a project manager to step in if role confusion is suspected and clarify roles to ensure that everyone is aware of expectations. Creating a RACI matrix is helpful to get started working on any project -- big or small, simple or complex. Once you’ve completed your matrix, you need a collaborative, real-time tool to help manage project details from start to finish. One such tool is Smartsheet, a work management and automation platform that enables enterprises and teams to get from idea to impact - fast. 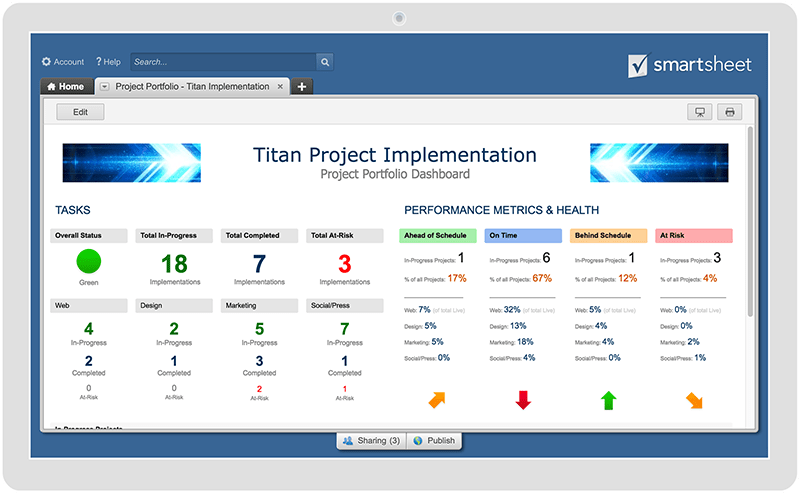 Top project management leaders rely on Smartsheet to help align the right people, resources, and schedules to get work done. Want more project management tips and best practices? Check out our Project Management Resource Hub for the latest articles, templates, and more! I've found this page very useful in support of my work within the PMO and intend to promote to other fellow project managers.